Aim and Objective: Phenazines are substances with an extensive range of important applications. Recently, the synthesis of N-arylation has been made more feasible owing to the advent of a new methodology. But because the toxicity of the used oxidant and the low yield, it is necessary to find a nonpoisonous or less toxic oxidant. We report on the use of potassium permanganate as an oxidant to synthesize phenylphenazin-5- ium chlorides via sequential aniline arylation. 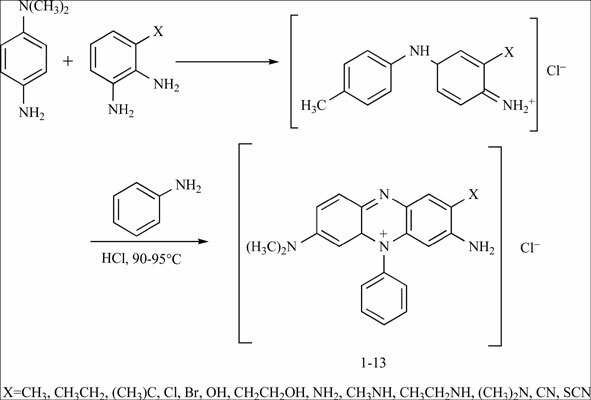 Materials and Methods: The corresponding 2-substituted-3-amino-5-phenyl-7-N,N-dimethylamino phenazinium chlorides were obtained via various o-substituted toluidines reacted with 4-amino-N,N-dimethyamine and aniline using potassium permanganate as an oxidant under different conditions such as temperature, pH, reaction time and the ratio of raw materials. Infrared (IR) absorption data were acquired on a Thermo Nicolet Nexus 670 FT-IR spectrometer with DTGS KBr detector. All the products were characterized by Mass, 1H and 13C NMR spectroscopy. The total C, H, N, content was measured by the elemental analyzer. Results: The yields of 3-amino-7-(N,N-dimethylamino)-2-substituted-5-phenylphenazin-5-ium chlorides are from 42.5% to 75.8% based on the electrophilic ability of different substituted groups under the temperature of 95°C, pH 4.5 and the reaction time of 8hrs. Conclusion: 3-Amino-7-(N,N-dimethylamino)-2-substituted-5-phenylphenazin-5-ium chlorides have been synthesized in high yields via the oxidative cyclization with potassium permanganate. This route is a simple, economic, efficient and environmentally friendly. Nitroaniline, aniline, phenzine, derivatives, potassium permanganate, oxidative cyclizatio, synthesis.